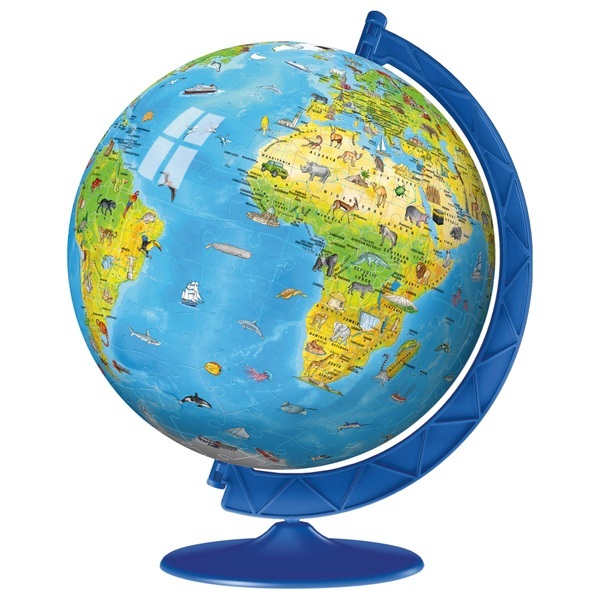 Ravensburger Children's World Map 3D Puzzle, 180pc is a great way to introduce your child to world geography. The design also shows different animals in the continents where they live 20cm in diamater and comes with its own display stand for rotation. The puzzleball can also be taken apart to complete again another day. What a fantastic way to learn about the geography of our world, including countries, continents and oceans! The 180 curved plastic pieces build into a sturdy 3D sphere, which comes with its own clever stand so the finished globe can be rotated. Each of the pieces is printed on the reverse side with numbers, so you can either assemble the puzzle by eye, or using the numbers. The finished puzzle measures approximately 20cm diameter when complete. A perfect present for youngsters who are interested in geography and travel.